The rumors and spy photos were true, as for the past few years Triumph has been working on a proper touring motorcycle named the Triumph Trophy. 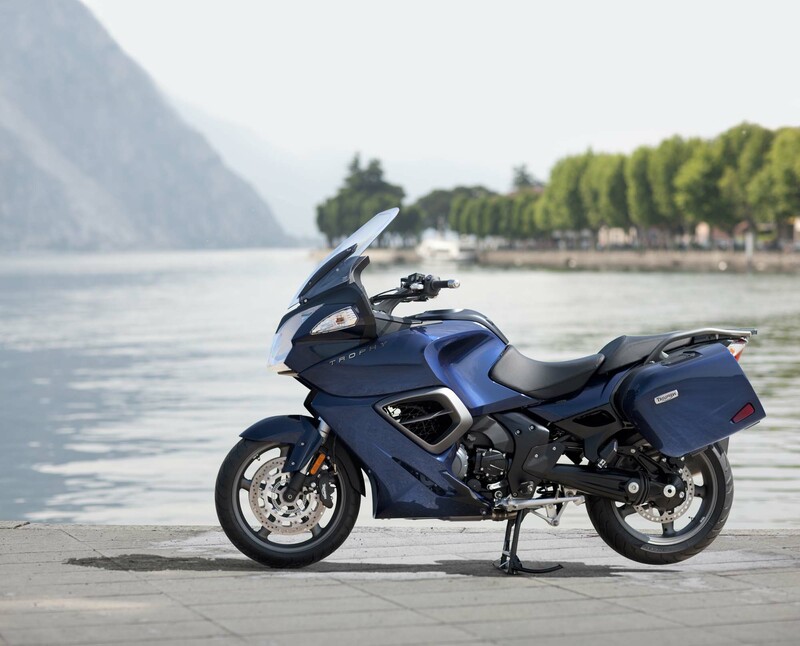 A direct assault on the BMW R1200RT and its progeny, the Triumph Trophy SE boasts the title of being the most technologically advanced Triumph motorcycle, ever. As you can tell then, the Trophy comes in two trim flavors, with the Triumph Trophy SE boasting some impressive tech to earn its title. Accordingly, the British tourer comes with electronically adjustable suspension, ride-by-wire throttle, traction control, electronic cruise control, linked anti-locking brakes, a tire pressure monitoring system, as well as some other features. While both models are shaft-driven and sport the same 132 bhp, 1215cc, three-cylinder motor that is found on the Triumph Explorer adventure-tourer, only the SE comes with the electronic suspension, audio package, and tire pressure monitoring system. 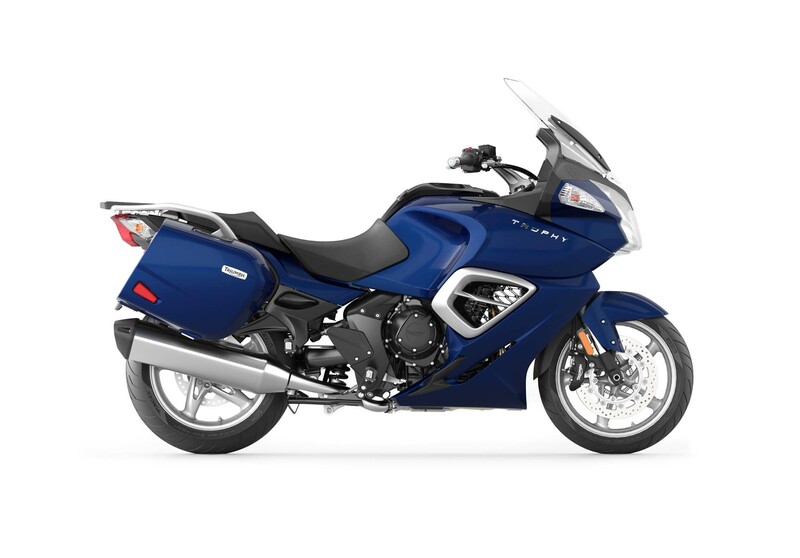 Realizing that Americans and Canadians enjoy their gizmos, the Triumph Trophy SE will be the only variant coming to the North American market, while the SE and base model will be available in all the other Trophy markets. Admittedly, the 2013 Triumph Trophy SE doesn’t stand apart in any one spec-sheet category, but Triumph has put together a very well-rounded package with the Trophy. 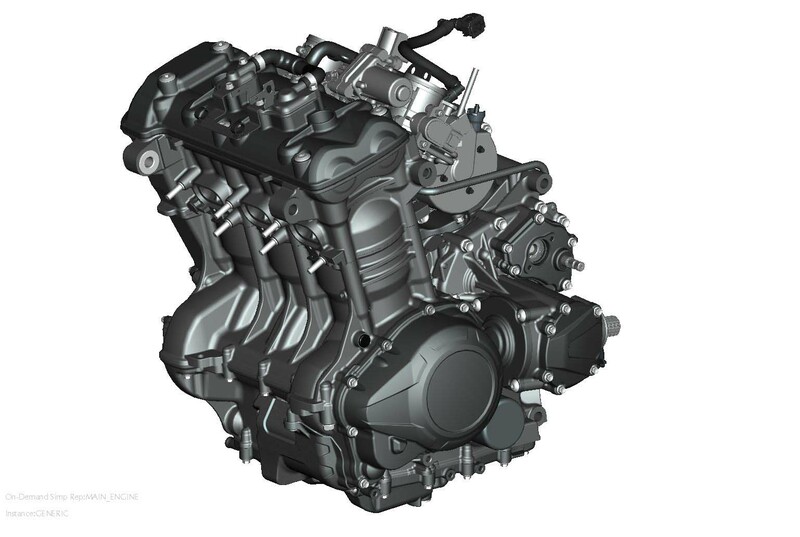 The peppy three-cylinder motor is one of the most powerful in its class, and though the 662 lbs curb weight (with fuel, without panniers) sounds heavy in sport bike standards, it is fairly reasonable for the touring class, especially considering the Triumph Trophy’s 6.86 gallon fuel tank size. A market segment lead by technology, Triumph has added a competent features package to the bike, which makes the Triumph Trophy SE an enticing entry for tourers to consider, especially those with a sporty-tooth. Of course without knowing how the Trophy handles on the road, and how Triumph will price it against its stout competition, it is hard to give a full-assessment of the British brand’s latest creation, but so far we are pretty enthusiastic. Perhaps receiving lower marks for its appearance, it is hard to find any real stunning touring bikes on the market right now. Though, it is clear from how the Trophy is spec’d and built that Triumph clearly had BMW on the brain while creating the Triumph Trophy and Triumph Trophy SE. 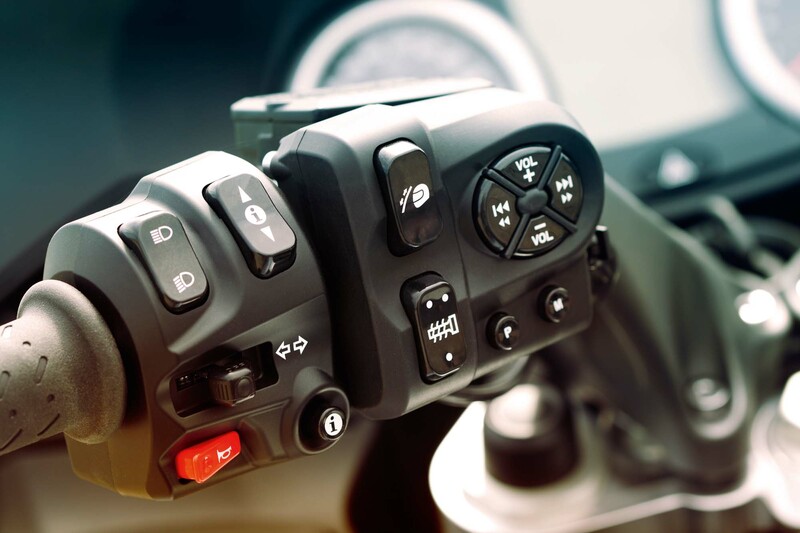 Helping achieve the best on-road package possible, Triumph has followed suit from BMW and Ducati with the integration of an electronic suspension system, courtesy of WP Suspension (an interesting choice in its own right). Sporting 43mm forks and a rear shock with remote oil reserve, the WP-made piece adjust the preload on the rear suspension three-ways: one-up, one-up with luggage, and two-up, while the rebound can also be set to three different specs on the forks and shock: sport, normal, and comfort. Sorry, riders you will be adjusting your compression the old fashioned way. Another one of the more interesting features on the Triumph Trophy and Triumph Trophy SE is the Triumph Dynamic Luggage System, which maintains the bike’s weight distribution by decoupling the pannier mass from the chassis, and allowing the storage areas to move in a 5° arc compared to the motorcycle. 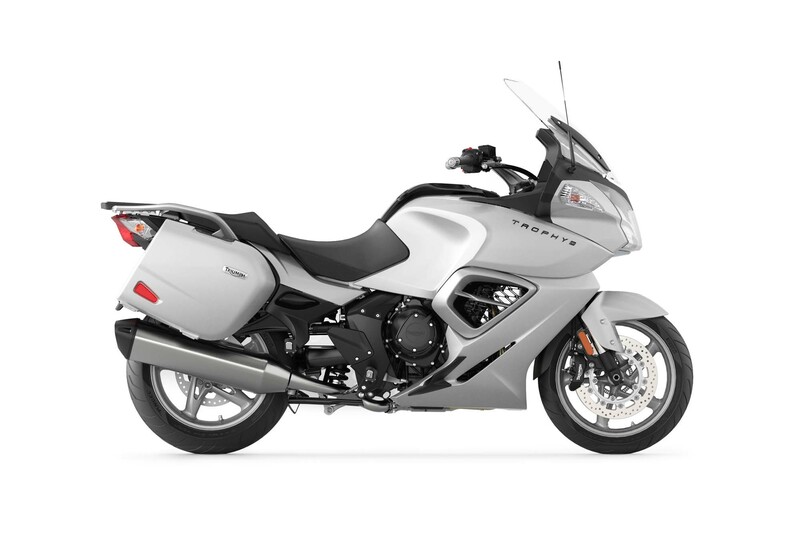 Each pannier has 31 liters of storage, while an optional 55 liter “plug & play” top box can also be added to the bike, for a total of 117 liters of storage (that is a total of 30.9 ‘merican gallons folks). 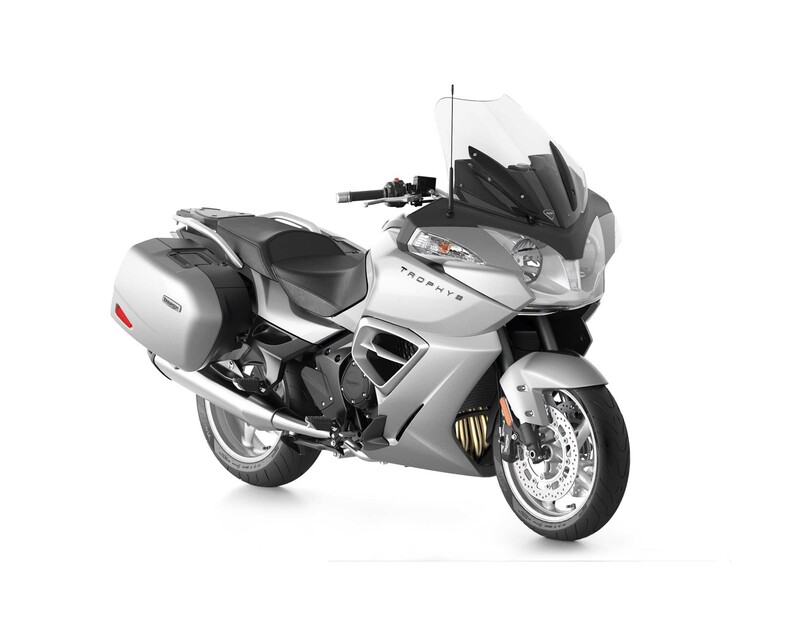 The top box gets its plug and play name for the 12V electrical system inside the box that connects to the Trophy’s electric system automatically when it is fitted onto the bike — a feature that is ideal for charging while on-the-go. 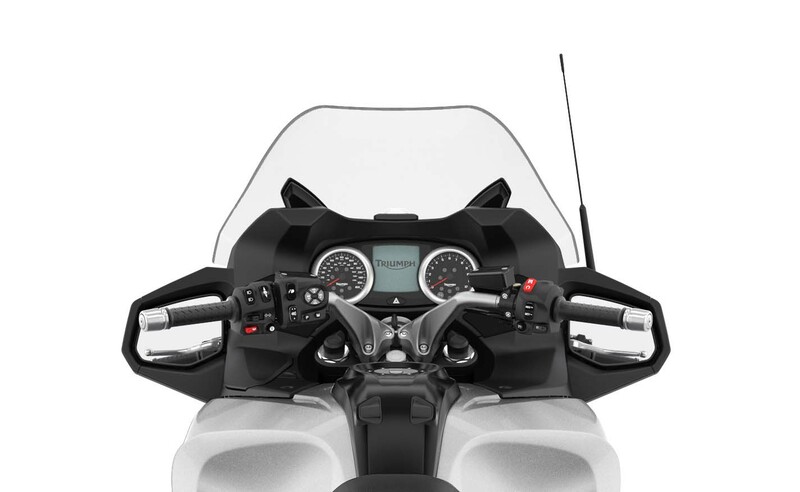 Other features on the Triumph Trophy include an adjustable windscreen and seat height. Available in Pacific Blue or Lunar Silver paint, Triumph says the Trophy SE will be on US shores in January of 2013, though the bike will be making its public debut shortly this summer, at the Triumph Tridays in Neukirchen, Austria on June 22nd-24th. No word on pricing at this point int ime, though Triumph says it will release those details later this year. 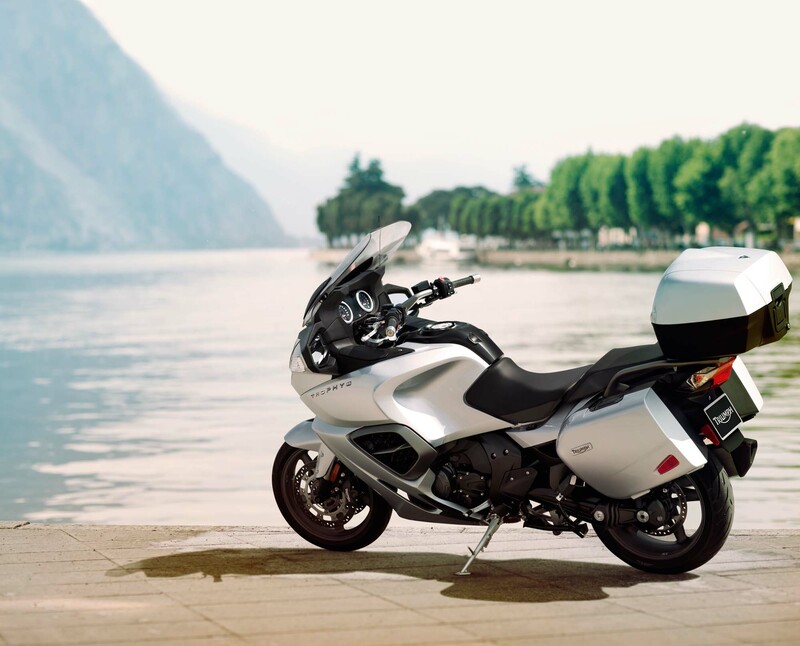 We would expect the 2012 Triumph Trophy SE to be very competitive against the competition here in the United States, especially against the BMW R1200RT.